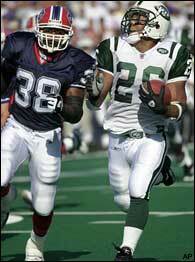 The overhauled New York Jets faced rivals from the AFC East, the Buffalo Bills, in a Week 1 contest on September 8, 2002. The Jets had gone 10-6 and reached the playoffs in their first year under Head Coach Herman Edwards, but had made significant roster moves, especially on defense. The offense still had 38-year-old QB Vinny Testaverde behind center to start the season, even if not best suited for a West Coast-style offense, and RB Curtis Martin was a highly productive ball carrier. The Bills were coming off of a miserable 3-13 record under Head Coach Gregg Williams but had also done some retooling, most notably in acquiring a new veteran quarterback. 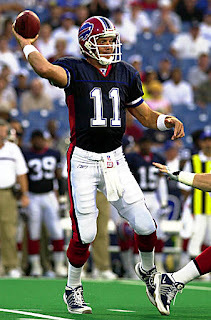 Drew Bledsoe was obtained from the Patriots, where he had been displaced by the previously-unknown Tom Brady. In addition, RB Travis Henry was healthy following a promising rookie year that ended with a knee injury. There were 72,751 fans in attendance at Ralph Wilson Stadium on an 86-degree afternoon. The Bills started the game off with a drive that was kept alive by a roughing-the-kicker penalty on a punt. Drew Bledsoe completed four passes, two of them to Travis Henry, and Mike Hollis finished it off with a 52-yard field goal. The Jets punted twice, with an interception of a Bledsoe pass by CB Aaron Beasley at the New York 20 in between, before Buffalo went 80 yards in seven plays that stretched into the second quarter and included three penalties on the New York defense. Following consecutive pass completions by Bledsoe to get the ball down to the Jets’ five, Henry ran up the middle from there for a touchdown. Hollis added the extra point for a 10-0 lead. The ten-point margin didn’t last for long when diminutive RB Chad Morton (pictured above) returned the ensuing kickoff 98 yards for a TD. John Hall converted to make it a 10-7 contest. On Buffalo’s third play of the next series, a poorly thrown Bledsoe pass was picked off by CB Donnie Abraham, who returned it 13 yards to the Buffalo 19. While two penalties pushed the Jets back ten yards, Vinny Testaverde passed to TE Anthony Becht for a 21-yard gain and, helped further by a pass interference call, it was Testaverde to Becht once again for a one-yard touchdown. Hall booted the point after and, in short order, the visitors were in front by a score of 14-10. The Bills responded with a drive of 74 yards in 11 plays. Bledsoe connected on four passes, with two of them to WR Peerless Price that included a 19-yard gain on a third-and-seven play to the New York 29, and Henry finished the series off with four straight runs, the last for three yards and a TD. Hollis added the PAT and Buffalo was up by 17-14 with 2:41 remaining in the first half. Testaverde passed the Jets down the field, hitting Curtis Martin five times out of the backfield, including a 12-yard gain that converted third-and-nine and a 16-yard play that set up Hall’s 34-yard field goal. The teams went into halftime with the score tied at 17-17. New York had the ball first to start the third quarter and was without Martin, who had suffered a sprained ankle at the end of the first half. Testaverde completed a pass to WR Santana Moss and RB LaMont Jordan, Martin’s replacement, ran for 14 yards to reach the Buffalo 32. After advancing to the 27, a third down pass to Morton that was first credited as a catch to the one was overturned upon review, but the Jets regained the lead on a 45-yard Hall field goal. The Jets took possession soon after at their own 46 following a fumble by Henry, but lost ground and had to punt, and the Bills punted in return. On the second play of the next New York series, Jordan fumbled when hit by DT Pat Williams, LB Keith Newman recovered, and Buffalo took over at the Jets’ 29. Three runs by Henry picked up 20 yards and, after a short completion to WR Eric Moulds, it was Henry again to complete the six-play possession with a two-yard touchdown carry. Hollis converted to make it 24-20 in favor of the Bills entering the fourth quarter. The Jets had the ball heading into the final period but Hall’s 48-yard field goal attempt was wide to the right. However, a short series by the Bills resulted in a punt that was blocked by LB Jason Glenn. Gaining possession at the Buffalo 24, Testaverde completed a pass to Becht for eight yards and Hall was successful on a 33-yard field goal try that narrowed the home team’s lead to 24-23. The Bills came through with a big play on their next series as Bledsoe passed to Moulds for a gain of 52 yards to the New York 28, but a sack by DE John Abraham pushed Buffalo back and Hollis missed the resulting long field goal attempt from 50 yards. Testaverde came out throwing in response, connecting with WR Laveranues Coles for eight yards, Jordan for seven, and FB Richie Anderson for nine yards. An interception was wiped out by a pass interference penalty and Testaverde made the most of the reprieve as he threw to WR Wayne Chrebet for an 18-yard TD and then passed to Becht for a two-point conversion that gave the Jets a 31-24 lead with 4:47 left in regulation. The Bills appeared to be stymied at their own 33 after Bledsoe was sacked by NT Jason Ferguson for a seven-yard loss on a third-and-ten play, but the resulting punt drew a roughing-the-kicker penalty and Buffalo remained alive at its 48. Four plays later, Bledsoe converted fourth-and-two with a completion to Price for 14 yards and the drive finally ended with a dramatic fourth-and-nine pass from Bledsoe to Moulds for a 29-yard touchdown. Hollis added the all-important extra point and the game was tied at 31-31 with 34 seconds remaining on the clock. The contest went into overtime, and the Jets won the toss. Hollis kicked toward the sideline, but Morton fielded it, made a cutback against the grain and, 96 yards and 14 seconds later, crossed the goal line to win the game for the Jets in stunning fashion by a final score of 37-31. The Bills led in total yards (384 to 266), first downs (26 to 18), and time of possession (39:08 to 21:06). However, Buffalo also turned the ball over three times, to one by the Jets, and the special teams gave up the two touchdowns on kickoff returns plus a blocked punt that set up another New York score. There were many penalties, with each team being flagged ten times apiece. Chad Morton was the headliner for the Jets as he averaged 46.3 yards on six kickoff returns that included the two touchdowns, making him the fifth player in NFL history to do so in a single game. Vinny Testaverde completed 24 of 30 passes for 210 yards and two TDs while giving up no interceptions. Wayne Chrebet had five catches for 58 yards and a score and Curtis Martin also caught five, for 35 yards, although he was held to only six yards on four carries before being forced to leave the game. LaMont Jordan led the team with 32 rushing yards on 7 attempts. For the Bills, Drew Bledsoe (pictured at left) was successful on 26 of 39 throws for 271 yards and a touchdown, but he also was intercepted twice. Travis Henry rushed for 149 yards on 31 carries that included three TDs and caught 6 passes for 29 yards. Eric Moulds topped the receivers with 8 catches for 112 yards and the game-tying touchdown that sent the game into overtime while Peerless Price contributed 7 receptions for 80 yards. The nightmare followed for the Jets, who lost their next four games but, with QB Chad Pennington taking over for Testaverde, finished strong to end up at 9-7 and first in the NFC East. They thrashed the Colts in the Wild Card playoff round before losing to Oakland at the Divisional level. Buffalo won two of its next three games, both in overtime, but after reaching 5-3 a midseason slump that included another, more decisive, loss to New York sent them to an 8-8 record and fourth in the division. Chad Morton averaged 26.0 yards, which ranked second in the AFC, on his 58 kickoff returns that included his two first-week touchdowns. For his seven-season career with four teams, he averaged 23.6 yards returning 229 kickoffs, scoring a total of three TDs, and 9.2 yards on 155 punt returns with one score. Both Drew Bledsoe and Travis Henry went on to have Pro Bowl seasons for the Bills. Bledsoe started every game and passed for 4359 yards and 24 touchdowns. Henry rushed for 1438 yards and 13 TDs in his finest season.